From ski gear to jackets (and winter camping gear, packs, and more) brands congregate each winter in Utah to launch new products at the Outdoor Retailer trade show. 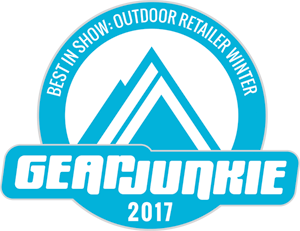 Our team of experts spent the week evaluating hundreds of products at the massive event to find the best to-be-released gear for 2017. Crescent Moon redefined the category with the Eva, a rockered snowshoe made of EVA foam. (This is the soft kind of foam used in shoe midsoles.) Because of the rocker, no hinge is required underfoot. The result is a maneuverable snowshoe that seems incredible for running or in moderate snow depths. We tested them briefly and were impressed. Built into a ski pole, a new kind of snow probe is now available for the masses. Insert the Scope from Mountain Hub into a snowpack and it measures the hardness of snow layers and creates a profile. The info is transmitted by Bluetooth to a phone and then used to assess avalanche risk. It won’t replace digging pits but is a new tool for those traveling in avalanche terrain. The digital info can also be shared to the brand’s website for crowd-sourced avalanche forecasting. Lasers and pressure sensors scan your feet, then a 3D printer creates a made-to-order insole or recovery shoe. That is the concept behind a new technology partnership between HP and Superfeet. The scans work (we tried it) and it seems the technology could open a world of footwear innovation at the retail level. Patagonia employs a new kind of synthetic insulation for its Hyper Puff Hoody. It is slightly heavier but much warmer than other insulation types used in its lineup. The HyperDAS insulation is layered like an accordion, so it lofts outward. This creates huge dead air space, adding significant insulation from the cold. It also packs very well for a synthetic jacket, fitting into a stuff sack the size of a one-quart jug. Helly Hansen’s purpose-built IPA Vest for snow professionals gives instant access to a snow probe and shovel. Simply grab a loop on the back of the pack and pull — the kit pops free for instant access. The vest-pack is designed with working ski patrollers in mind, with points for explosives attachment, radios, medical kits, and more. It’s a big deal because every second counts during avalanche rescue. Dip a small battery-like cylinder in saltwater and insert it into a lantern for 100 hours of power. That’s the concept behind Hydra-Light, a unique power-generation system that creates electricity from a reaction between water and a magnesium coil. The residue is magnesium hydroxide (a non-toxic substance also known as milk of magnesia) and each $8-$12 battery pack lasts for a claimed 300 hours. The Tecton 12 bindings by Fritschi bring more safety to the tech-binding world by combining a tech-style toe with an alpine-style heel. It has a pre-defined lateral release on the front and rear, and is 100 grams lighter than the closest competitor, the Marker Kingpin. They also have a “safety bumper” to release skiers from the front pins during a forward fall and heel ejection, an important addition. Polartec made a few modifications to its Alpha insulation so it can be used “naked,” meaning with no face or liner fabric. Thus, this is likely the most breathable, air permeable, lightest synthetic insulating solution yet. Look for it on fuzzy mid-layers from Rab and other brands soon. The North Face took its highly-breathable, proprietary active insulation and poked holes in it, literally. The Summit L3 Ventrix Hoodie has laser perforations where athletes sweat so the jacket vents as the body moves. When activity decreases, the perforations stay closed to keep in heat. We checked it out, and the holes open like Swiss cheese when the fabric is stretched to help promote sweat evaporation. Power anywhere, anytime is the goal with a new “ecosystem” of products from Goal Zero. It includes a gas generator, a battery unit, and solar panels. The Fuel generator and battery system stand apart from other options as “20 times more efficient” than a typical gas-power unit, the brand states. (See our full article here.) The Yeti 3000 lithium battery can run a saw, blender, or other high-surge electronic devices. The batteries can be chained and are compatible with solar. Put it all together and it’s a powerful new option for large electricity needs off the grid.